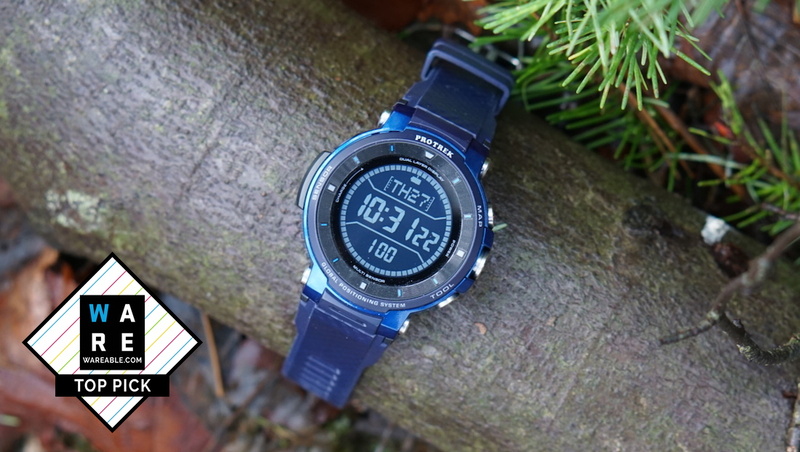 Casio is back for a third crack at its outdoor smartwatch with the Casio Pro Trek WSD-F30. It’s safe to say the previous generations haven’t hit home, and we’ve been critical of the unmanageable size, bugginess of apps and general experience. But with the WSD-F30, Casio may finally have got the formula right. The Pro Trek WSD-F30 has been slimmed down just a tad, while managing to keep the same military grade toughness (MIL-STD-810G) of its predecessors. The company has managed to up battery life, too – and is finally getting some help from Google, with its rapidly-improving Wear OS. On paper, the upgrades look impressive. But has Casio done enough to make up for the issues in its two previous Wear smartwatch iterations? We've been putting the outdoor smartwatch to the test to find out. Here's our full verdict. Like its predecessors, as soon as you take the WSD-F30 out of the box it screams 'outdoors'. It’s a chunky ol' watch with the kind of outdoor watch design hallmarks that instantly tell you this is another rugged timepiece designed to withstand some serious rough and tumble. Labels surround the outside bezel to proudly show off the key features: tool, map, sensor and GPS. Casio has addressed one of our major gripes with the previous models, shaving 3.9mm off the width and 0.4mm from the thickness, which makes it slightly thinner than something like the Suunto 9 or Garmin Fenix 5X Plus. It’s still big at 53.8mm wide, 60.5mm long and 14.9mm thick, but the dimension changes are noticeable if you’ve lived with either of the two previous Casio watches. Even with the sizing changes it still combines military grade protection (MIL-STD-810G) with waterproofing up to 50 metres. Three large buttons sit along the right side of the watch and nestle within the body. The size and textured design of the buttons makes for easy operation when you’re wearing gloves, without snagging on your bag or jacket as you move around. On the left side is a slightly raised sensor block, which is barely noticeable and there is once again a proprietary Casio magnetic charging point on the top left. This charging point was an issue for us when we reviewed the WSD-F20, and unfortunately this is still the case as the slightest knock can pull the supplied lead out. Not quite so bad if you’re charging at home, but very difficult to confidently juice with a portable battery pack. There are three colour variants available: orange, blue and black. Our preference is the blue, largely because it exists as a subtler option to the fairly bright orange, but still retains the aesthetic qualities that make the new design features more appealing than the previous models. The watch comes with one large strap. It does the job but it’s nothing special. If you have a smaller wrist, you’ll need to buy a new one as you end up with a big flap of plastic sticking out the top which can snag on clothing. At the heart of the WSD-F30 is a 1.2-inch dual layer display. This is made up of a colour 390 x 390 resolution OLED display and monochrome LCD display. The slightly more detailed colour screen is a welcome improvement on the WSD-F20 in terms of screen visibility. The watch comes preset with a selection of faces, so customising the digital design is an easy process. If you can’t find one you like that features the sensor readouts you want, head to Google Play to download a new one. In normal mode the OLED screen will disappear after a couple of seconds if you stop looking at it; it’ll then revert to the monochrome LCD display, which looks just like a bog-standard, yet familiar Casio watch. Accessing the various tools and functions within the WSD-F30 utilises a combination of both the three buttons on the right-hand side and the touchscreen. The latter are by far the easiest, with each of the three buttons taking you directly to either the map, a list of available apps and tools or a set of dashboards to view the sensors. Using the touchscreen is significantly more complex and requires a fair bit of investment to get the hang of before attempting any sort of outdoor activities. The main UX works on a system of flicking left and right to scroll through menus, editing options and closing the app you’re currently using. The system is slightly inconsistent though and we found ourselves struggling to close some of the tools or finding the various menu options within them. We advise getting fully to grips with the system before attempting to take it outdoors. The sensors built in are pretty much the same ones you'll find inside the WSD-F20. That includes pressure (air pressure, altitude), the smartwatch standard accelerometer to track motion, a gyrometer and a compass. There is crucially, built-in GPS with support for GLONASS and QZSS (Michibiki) satellite tracking systems to give you pretty comprehensive mapping coverage. Presumably to limit size as well as battery usage, Casio have still opted not to include a heart rate monitor sensor. Although it’s primarily targeted towards activities where heart rate may not be a primary focus, it’s still surprising to see a smartwatch at this price have no HR support. Casio have essentially taken this off the radar of anyone hoping to use this as a general use smartwatch outside of the key outdoor-centric activities it supports. Tested against the Garmin Instinct the accuracy of those sensors seems to match up very well. Widgets dedicated to data from those sensors can be accessed very easily by pressing the bottom physical button on the right-hand side of the watch. These screens are actually by far some of the slickest elements of the software experience. Speaking of software, the WSD-F30 does once again run on Google's Wear operating system. This gives you access to all the usual features like notification support, the ability to download apps directly from the watch and access Google Assistant. You know the drill. By clicking the Tools button on the watch, you can also open up the range of pre-loaded apps available. The list is largely what you’d expect from a Wear OS watch. So things like agenda, alarm, contacts, find my phone, reminders and stopwatch. There's nothing particularly exciting there. The ones that are actually important are Location Memory, Point Navigation, Extend Mode, Multi Timepiece and Activity. Both Location Memory and Point Navigation are functions within the map tool itself but can be accessed through the tool menu (more about those later). Extend Mode and Multi Timepiece are two of the nicest features of the WSD-F30, which we'll dig deeper into when we get onto the subject of battery life. Activity is where you specify what you’re doing before starting to track it. This covers five key “activities”: trekking, fishing, cycling, paddle and snow. Once started, each of these functions provides real-time information from the sensors, displayed specifically for that activity. For trekking, the data shown highlights the speed you’re moving, the time, your elevation and how long you’ve been going for. Scroll to the right and you’ll get an overview of ascent and descent, then, scroll once more and it’ll take you to the GPS map. If you have the dual screen battery saver mode set up, you’ll see a minimal, LCD style screen of this information. You also get a list of featured apps, which are essentially the ones that Casio is suggesting you use to get the best of the watch; these include apps like Hole19 (golf), Glassy (surfing), Ski Tracks (snowsports) and Fishbrain (fishing). The most important downloadable apps we’ve found are ViewRanger and Moment Setter. Firstly, Moment Setter is a nice little app specific to Casio wearables, which allows you to customise notifications using the sensor information available. At first glance it’s little more than a notification tool, but when you drill down into the customisable options available it actually becomes a very powerful tool. An update when you’ve hit 1,500 metres of ascent may not seem like the most valuable information, but a timely reminder of when the sun is going down or a noticeable drop in air pressure could be extremely important. Combining this with the map for notifications on nearing previous locations you’ve been, or when you’re leaving a designated perimeter, is very handy indeed. ViewRanger basically takes the WSD-F30 up a significant notch in terms of hiking. For us the major issue seen in a lot of outdoors devices is the lack of real Ordinance Survey information available in map functionality. VeiwRanger utilises OS maps along with the GPS in the watch to not only offer clear topographical guidance, but you can also search for user-submitted routes, complete with explanatory directions to make things a bit easier. We found the app when accessed on the phone and watch to be very easy to use, the only downside is that the majority of functionality available comes at a $24.99 monthly cost to access a set amount of map features. You do also have a pay as you go option, but whatever way you cut it, you'll need to pay up for those extras. At the core of the WSD-F30 is, as you’d hope, mapping. Although the watch comes complete with its own GPS, this is pretty much useless unless you have a map to display it. Fine if you have a signal as the watch pulls the map directly from your phone via the Bluetooth connection, but if you’re actually in a location with no signal, it’s not going to help you. The watch comes with two map options built into the software: Google Maps and Mapbox, and pops up instantly by pressing the top button on the watch. To rectify this, you can actually download maps of up to 50km via your phone connection. This is obviously a major plus point as the majority of places hikers go to inevitably have very a minimal data signal. Also, Mapbox, as far as we’re concerned, has much nicer topographical detail. It’s by no means Ordinance Survey level, but it’s a little bit more helpful when you’re in the middle of the countryside or hiking up a mountain. They do take a while to download though, so you need to put aside at least an hour to set them up. You can have up to five maps downloaded onto the watch at any time, which is more than enough. Operating and using the maps, like a lot of the other features on the watch, is a bit tricky at first and can be somewhat frustrating to get the hang of. Essentially, the map screen on the watch allows you to scroll around a map and set a navigation point. Once set, a line will point you in that direction. Depending on where you are, this can be very helpful, assuming there are noticeable landmarks, or simply a compass direction, for example if you’re stood in the middle of flat moorland. Aside from an option to mark places on the map or leave a voice note at certain locations, you can also view a history of routes you’ve taken, save daily locations or export your routes as .kml files to review on another device or upload to another piece of software. Aside from that, the out of the box map functions are relatively simple. Which, to be honest, is not a bad thing, and in the case of a watch like the Garmin Instinct or Fenix, the simplicity is one of the key factors. At around $500 though, you’re going to want it to do a bit more, and with full access to Wear OS, luckily you can by downloading apps like ViewRanger. For any watch designed to handle prolonged periods in the outdoors, battery is by far one of the most important factors. That trade-off between functionality and the time you have before you need to charge it again. An update to the WSD-F30 sees two new power modes, which utilise the dual display screens to prolong battery life for as long as possible. In normal mode you should get 1.5 days of charge flicking between the OLED colour screen and monochrome options while using GPS, Bluetooth and Wi-Fi. There's also additionally Multi-Timepiece mode and Extend modes. Multi-Timepiece mode reverts entirely to the monochrome screen while turning off the bulk of the functions that exist, essentially converting it into a run of the mill digital watch with step count or a slightly more functional outdoor option, which includes limited sensor data. The result may just be the equivalent of a budget Casio, but at 30 days battery life it’s still a lot more useful than a smartwatch with no battery at all. The third mode is Extend mode, which is a compromise between the two featuring some nice intuitive functions. It basically means you decide the tools and sensors you want and offset that against the battery life. If you’re not bothered about air pressure or altitude, get rid of them. You can also set it up to operate at a higher level for a set timeframe throughout the day, so you can pre-plan your power usage based on what you’re expecting to do. Depending on the decisions you make this mode should give you around three days of battery life. In our experience, the WSD-F30 performed pretty well on the battery front. The normal mode on average finished a day of normal use with about 30-40% of power remaining. The Extend mode had 83% of battery left after four days. Multi-Timepiece mode on the other hand is so heavily dependent on the set-up decisions you make that it’s a bit of trial and error as to what factors have the biggest effect on the battery life. When you do hit 0%, the watch generally takes about three hours hours to charge fully, so if you're planning to take it on a big hike and haven't charged, you might be waiting a while to take this with you. The WSD-F30, much like the F20, is a smartwatch that offers something different to the majority of the Wear OS contingent. The improvements made on previous iterations do shine and Casio has clearly put a lot of work into listening to feedback and making improvements to the design and software. If you're after a comprehensive outdoor watch but still want the features of a good smartwatch, then it certainly hits the sweet spot. But, there are watches that will give you better battery life in a slimmer design if you can bypass some of those added smarts. If those features are a priority for buying an outdoor watch, you might be better served investing in one of Garmin or Suunto's outdoor watches. Unfortunately, since Casio doesn't honor it's warranties and they have knowingly sold defective products, you're taking a $650+ gamble if you buy one. There is one thing you are completely ignoring, or am I hallucinating / succumbing to my wishful thinking: NO FLAT TYRE??? How is the sunlight readability compared to the fenix 5x plus? I havea fenix 5x plus but am a casio fan too.